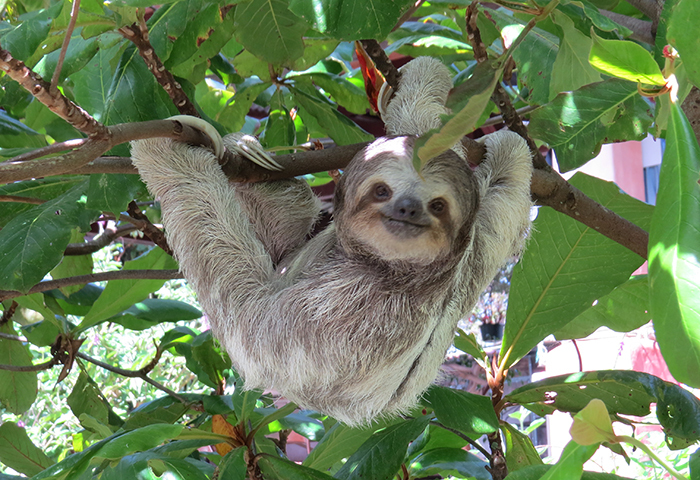 So you want to see sloths in Costa Rica? When you are traveling to Tortuguero (Or Arenal, or Manuel Antonio… to mention a few) all of a sudden the driver stops, in the middle of nowhere. You look around and don’t know what’s going on… Up until the tour-guide points up, and you see this fur ball all the way up on a tree. Slowly moves its head and looks around. And you realize you are watching a sloth! When the early scientists first described the sloths in the 1700s, they totally misinterpreted this fantastic animal. They described the slow-moving animals as lazy and useless and thought the species was unlikely to endure its imperfections. In recent years sloths have undergone an image makeover and are now promoted across the Internet as the most charming creatures on the planet. Though finding a wild sloth can be a challenge (they live in trees after all), sloths are actually among the best-adapted creatures in the rain forest. The mammals spend almost their entire lives in trees, which shields them from their natural predators, and biologists estimate that sloths make up more than half the total biomass of rain forests in Central and South America. 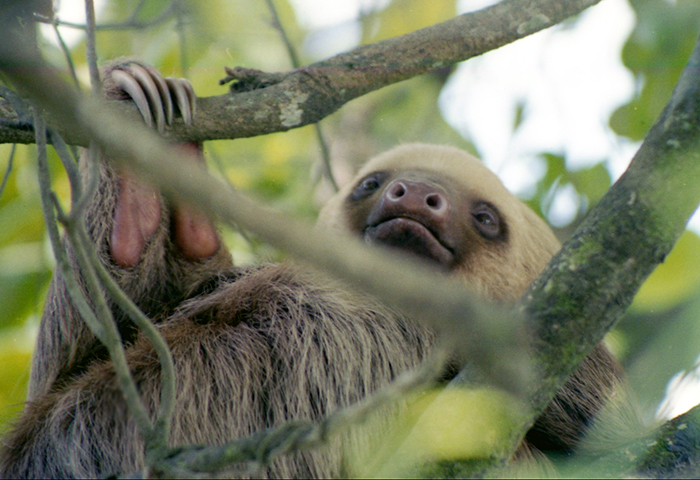 They may have cute, piggy faces, but wild sloths aren’t the kind of creatures you would want to cuddle up with at night. A sloth’s fur actually works as an ecological community supporting colonies of moths and algae. Helping sloths blend in with the vegetation, the mammal’s own algae fields also serve as a food source.Yes! Sloths eat algae that develop out of their fur. Researchers now believe that sloths sustain these mini-ecosystems by fertilizing them with their own feces. 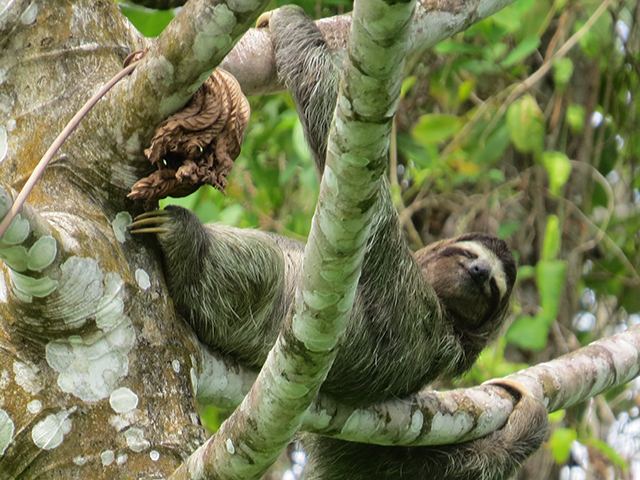 Sloths have little reason to leave the safety of the rain forest canopy, but once a week the slow mammals sink to the base of their favorite tree in order to defecate. The exact reason why sloths make this dangerous journey is still a puzzle, but researchers think that it may help maintain the algae gardens in their fur. Equipping wild sloths with backpacks that track their movements, a researcher in Costa Rica recently determined that sloths spend almost all of their time invested. To handle the pull of gravity, sloths have evolved special fibrous adhesions that keep their organs from shifting. They live in the trees. Any tree, by the roads and in National Parks. Up until the 1960’s, there were sloths living in the old trees that existed in the Central Park os San Jose. So, you may be able to see them, just by coming to Costa Rica and getting on the road to any of the great destinations we offer! Ask our travel consultants.